The other day I mentioned that rain barrels make great gifts for the holidays. Well, here's another idea for eco-friendly gifts that are guaranteed to get plenty of use, especially if given early - reusable shopping bags. I know that may not SOUND very exciting, but everyone needs these handy shopping bags, and they are available in all sorts of sizes and styles that help take the drudgery out of dragging around your shopping. My favorites are the kind that you can fold up and carry in your purse. Plastic shopping bags have long been a bane to the environment. The United States uses about 100 billion disposable shopping bags per year, made with 12 million barrels of oil. If disposed of improperly, these bags pollute our waterways and taxpayers end up footing the bill to clean up this polluting plastic. Several years ago, DC enacted a 5 cent bag fee for plastic bags. The result? In the first month of its implementation, plastic bag use fell by 19 million bags! Starting in January 2012, a five-cent bag fee will go into effect in Montgomery County and discussions for similar fees are still under way for areas such as Prince George's County. I’m excited about this news! In the Anacostia streams in Prince George's County (and likely in many other streams in the area), disposable shopping bags are the single largest type of trash. I have to admit, I was a (reusable) “bag lady” long before it was either chic or cheap to do so. In fact, I take a little pride in carrying bags that help “advertise” some of my favorite causes and charities. So when you are trying to come up with gift ideas for your hard-to-shop-for friends on your holiday list, think of reusable bags. In fact, why not skip the wrapping paper and DELIVER your holiday gifts in re-usable bags. You’ll be helping the environment by keeping the wrapping paper out of the landfill and providing a much needed eco-tote for your friends. 2) Reusable shopping bag – folds into a strawberry! 6) Add your art, slogan or photo – Cafe Press and other sources let you design your own bag. And if you don't understand the importance of "banning the bag", here's a great video that was created for another great Bay -San Francisco Bay - but it definitely gets the point across in a BIG way. ﻿Followers of the Metro DC Lawn and Garden Blog know that I've mentioned several times what a great idea I think it would be for Michelle Obama to create a butterfly garden at the Whitehouse. Although I think teaching kids to plant their own vegetables is a great way to get them outside and eating healthy, my personal opinion is that encouraging them to get up close and personal with nature provides the added benefit of creating a new generation of environmental stewards. Well, move over Michelle Obama. First Lady Katie O'Malley has beat you to it - she's working towards getting the entire city of Annapolis certified as a National Wildlife Federation Community Habitat. If successful, Annapolis will become the Chesapeake Bay's first Community Habitat. A NWF Community Wildlife Habitat is a region that provides habitat for wildlife and practices sustainable gardening ─ in individual backyards, on school grounds and in public areas such as parks, community gardens, places of worship and businesses. The objective of NWF’s Community Habitat program is to create partnerships and help the City of Annapolis raise citizen awareness about watershed challenges and issues, and build ownership of local waterways─ with the ultimate goal of engaging more individuals and organizations in stewardship practices. In addition to providing a positive impact on the environment, creating a friendly environment for birds and butterflies is bound to draw more kids outside AND turn them into great environmental stewards. Receiving certification as a NWF Community Habitat is no easy task. It requires property owners, schools and businesses to join together to work towards earning the points necessary for achieving certification. 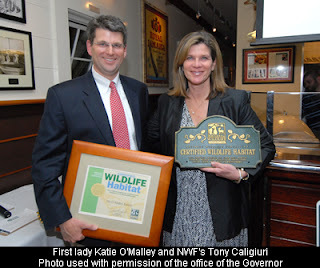 Kudos to First Lady Katie O'Malley for taking this positive step for the city of Annapolis. The Government House garden now houses a bee hive for honey, a water fountain to attract birds and bees, three water barrels, a natural setting of trees, brush and shrubs to provide shelter for animals and insects, a food garden, and natural landscape to reduce water usage and maintenance costs. Hmmm, how do I wrap a rain barrel? The Greenest Garden in DC? I saw an article in the Huffington Post recently, written by Nigel Sheinwald, British Ambassador to the United States. The article is entitled The Greenest Garden in Washington and lists some of the great eco-friendly features of the British Embassy. I love the fact that Sheinwald points out that today's gardeners need to be as concerned about the environment as they are about the good looks of their gardens. Below are some excerpts from the article: The single largest contributor to pollution in the Chesapeake Bay is chemicals applied to lawns and farms. To do our bit to combat this trend, the British Embassy adopted an organic approach to management of the Residence garden on Massachusetts Avenue in July of 2009. It has not been an easy task -- certainly spraying weeds is faster than plucking them by hand. But the extra work makes for a more responsibly and sustainably run garden. In order to reduce the amount of water we use, we have installed a 1,700-gallon cistern. The cistern is the central part of our grey water system, collecting rainwater that we then use in the greenhouse and elsewhere. We're cutting down our chemical use, too. An integrated pest management approach is helping reduce our dependence on pesticides and herbicides: we check plants for bugs before they're introduced to the greenhouse, and use horticultural oil and soap to eliminate the pests that make their way in. We now compost all weeds, branches, appropriate kitchen waste, leaves and grass clippings. Reducing what we take of public resources, and decreasing the chemicals we put into the air and water, stems from our goal of being a responsible member of the DC community. As well as being a good neighbour, we want to be an active participant in DC's verdant gardening scene. Our new rain garden slows down water flow across the property, so more water soaks into the soil. This reduces runoff onto Massachusetts Avenue, and helps us keep Winston Churchill's feet dry where he stands at the edge of the property. District of Columbia ordinances require properties to have some form of runoff control, and rain gardens have sprung up as a low-cost, aesthetically pleasing option. In many ways, gardening has much in common with diplomacy. The seeds you plant take careful care and cultivation to turn out well. Nothing is the same from year to year. You learn from what works -- and what doesn't -- to know better what to do the next time. And the end goal of your work is a productive area where all things have a chance to grow and thrive. Yes, it's a great article, but what do you think? Is the British Embassy really the GREENEST garden in DC? I love Thanksgiving, but my love of the holiday has very little to do with the actual meal that is the center of so many celebrations. What it does have to do with are the other sweets, treats and blessings that make up the daily feast that is my life. I love the word itself -- Thanks-giving -- which is like a bright neon flashing light reminding me of everything that I have to be thankful for, not just on the last Thursday of November, but every day. The people, of course, are the most scrumptious part of my life. My husband, although both a turkey and a ham, at times, is really the center of everything that is good in my life. But the rest of my family and friends are the perfect side-dishes to my life. Some are nutty. Some are mushy. Some nourish me. And some are just for pure pleasure! But my feast doesn’t stop there. I’m thankful for my health, my home, my work, my gardens, the critters in our yard that add daily wonders to our lives, all the healthy babies that are in our extended family. Every single day of my life, I have much to be thankful for. But there are days when I have to admit, I let the mundane and annoying aspects of my life get in the way, and I forget just how thankful I really am. But that is why I like this season, when everywhere you look, you are being reminded, that this is a time for Thanks-Giving. That was one of my favorite quotes when I was a young, romantic teenager. I’m still a romantic, although not quite as young as I used to be. And I still believe that one of the best ways to really appreciate anything is to think about how empty your life would be without it. It certainly works with age and time. When you are young, you think that your time on earth is endless, and you waste an awful lot of it. As you get older, your time is much more valuable to you, and you really don’t want to waste any. Since you can’t do a lot about the quantity of time you have left, you start making an effort to put more Quality into your time. You start making Bucket Lists of all of the things you want to do before you die. You realize you want to squeeze everything you can out of life, and not waste a drop. The problem with getting people to learn to appreciate and save things like natural resources…wildlife… the environment…and the planet in general, is that everyone thinks that there is an endless supply of those things. I just can’t imagine the day when there are no more lions or tigers or bears because of habitat loss or human predation, but it certainly could happen. Their numbers are dwindling because of stresses brought about by hunting, habitat destruction and introduced predators and diseases. Water, though, is another story. The planet will probably NEVER run out of water. That's because the amount of water is always the same -- it just changes in form. Water from oceans, lakes and rivers evaporates into the atmosphere where it becomes clouds and returns to Earth as rain or snow. However, we COULD run out of clean water. Almost all of the water on the Earth is salt water, and 77 percent of the fresh water is frozen at the Earth's poles. That leaves only a small amount for drinking, washing and growing things. As the Earth's population increases, more people need water and the earth’s supply of clean water gets even smaller. And a further problem, of course, is that a lot of the things that human beings do pollute water which means that we have to spend lots and lots of money to have water cleaned to make it usable again. As logical as this all is, people waste a heckuva lot of water. 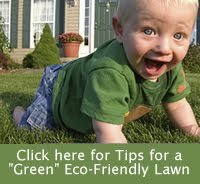 According to the EPA website, the average family of four can use 400 gallons of water every day. Let’s see. The current population of the United States is 312,625,280, divided by 4, times 400 gallons =……. Sorry, my calculator doesn’t go that high. But it’s a LOT. Still, I drive down the road and see people idly running sprinklers in the rain, or letting their hose run down the driveway while they are soaping their car or dog. Its hard to get people to understand the importance of conserving water. Around our house, one of the ways that we save water is with our Bucket List. We have a whole slew of buckets and watering cans, and we keep them filled up with water from our rain barrels, leftover water from steaming veggies, graywater from when we clean the hummingbird feeders, etc. We try to restrict ourselves to using JUST that water on our plants and gardens. And like the hours and minutes of our lives, we try not to waste a drop. I encourage you to start your own Bucket List for the planet. Put up a couple of rain barrels around your yard. They not only help collect water but are great at cutting down on stormwater runoff, which is one of the main things that pollutes clean water. And then start collecting watering cans and buckets. You can find them at garage sales and thrift stores for less than a dollar. And when you have enough of them, you rarely have to waste any clean water to keep your garden growing. As a green gardener, my favorite things to recycle are vegetable scraps, plant waste, grass clippings and leaves, which all make excellent additions to my compost pile. But for almost everything else you need to get rid of around your home, recycling of it properly helps reduce our impact on the local landfills. Since 1997, communities across the country have come together on November 15 to celebrate America Recycles Day. America Recycles Day is the only nationally recognized day dedicated to the promotion of recycling in the United States. One day to educate and motivate. One day to get our neighbors, friends and community leaders excited about what can be accomplished when we all work together. One day to make recycling bigger and better 365 days a year. Get involved! There are plenty of ways to participate in America Recycles Day in the Washington DC area. Check out the list and find something fun and GREEN to recognize the importance of recycling. Step #1 – Go outside. Take a 360 degree look around you. Consider how lucky you are to live in the United States of America. Now, go find a veteran. A veteran, of course, is someone who has served, or is serving in the military. That step shouldn’t be hard. You may have a veteran in your family, or work with a veteran. Perhaps your mailman or the elderly worker in the local hardware store is a veteran. If you aren’t sure, all you have to do is ask. Now, depending on your personality and temperament, the next step may be a little harder. Step #2 – Say thank you. Don’t worry. You don’t have to get all mushy about it. Depending on how well you know the veteran, you can add a pat on the back, a hug or a handshake. Just let them know that you are thanking them for their service. That’s it. That’s all you need to do to thank a veteran. And there really isn’t anything more organic and natural then a good, in person, heartfelt thank you. I grew up in the 70's, back in the days of tie-dye and hemp clothing and peace signs. It's funny to me now that so many of those things have come back into vogue. I was really too young to be a "hippie", but I did dress the part. I never attended a "sit-in" or a peace rally but I vehemently opposed the idea of war, in all of its forms. I held onto that belief throughout my life ... up until September 11, 2001. That date, of course, changed all of us. I still can't bring myself to say that I think war is the answer to anything, but I do understand the necessity of it now. And I do have a whole new level of respect, appreciation and admiration for the men and women who serve to protect our country, as well as the families who love them. One very positive change that has occurred in our country since my childhood is the respect that we show our military. When soldiers returned from Vietnam, they were sometimes met with icy stares, verbal abuse and even spit upon. Now, it is not unusual to see members of the military receiving applause or pats on the back as they walk through a crowded airport. I know that I always feel a tremendous rush of feelings when I see a man or woman in uniform. It's a combination of respect and admiration mixed with a gut-wrenching awareness of how I would feel if that was my son or daughter, brother or friend. 1) Say thank you - If you know a veteran, or the family of a veteran, give them a call or send an email and tell them that you appreciate what they have done, or are doing, for our country. 2) Listen- If they want to talk about their service, let them. I don't care if you have heard your father's or grandfather's war stories before. Ask them to tell you about them again. And listen this time! 3) Send some love - Even if you don't know any veterans, personally, it is still easy to express your thanks. Get out your phone book and find the closet VA hospital or nursing home and send a big, patriotic bouquet of flowers or a colorful collection of cookies. Add a note explaining that they are for the resident veterans, with your heartfelt thanks for their service. 4) Attend a parade - If there is a parade close by, go to it. Take your kids, buy them some flags to wave, and really hoot and holler at the members of the military, young and old, who are marching in the parade. 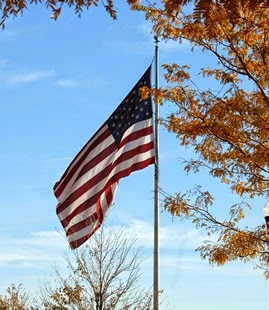 5) Visit a Veterans Day Services to pay your respects - In you can't find a parade, there are plenty of memorials that you can visit to pay your respects. 6) Fly a flag - Flying the American Flag is a great way to show pride and respect for our country. If you don't have a flagpole, you can purchase small brackets that easily fit on the front of your home or your mailbox. 7) Give time or money to veteran's groups - It's a tough year for everyone and you may not be able to afford to make cash donations to as many charities as you would like. But many groups will benefit from your time as much as they would from your cash donations. One of our favorite organizations is Home for Our Troops (HFOT), a non-profit organization that builds specially adapted homes for severely injured veterans. HFOT is currently looking for volunteers to work on several projects in Maryland and Virginia. 8 ) Plant a tree in memory of a veteran - Planting a tree is always a great way to honor someone and will give you a permanent place to return to year after year to spend time and appreciate your freedom. By the way, if you are wondering what the dedication and sacrifices of our veterans has to do with a gardening blog, the answer is "everything".